The Canadian province of Alberta is home to the richest source of dinosaur fossils on the planet, along with numerous world-leading museums, research facilities and attractions all related to these mesmerising prehistoric creatures. 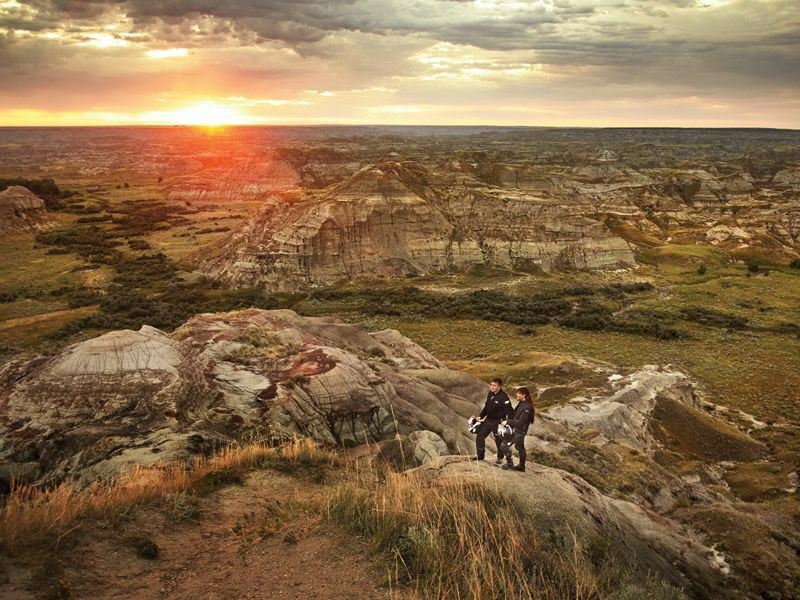 What’s more, all this is set against a spectacular Badlands backdrop of distinct ochre-coloured rock formations, unique coulee landscapes and endless grass prairies. 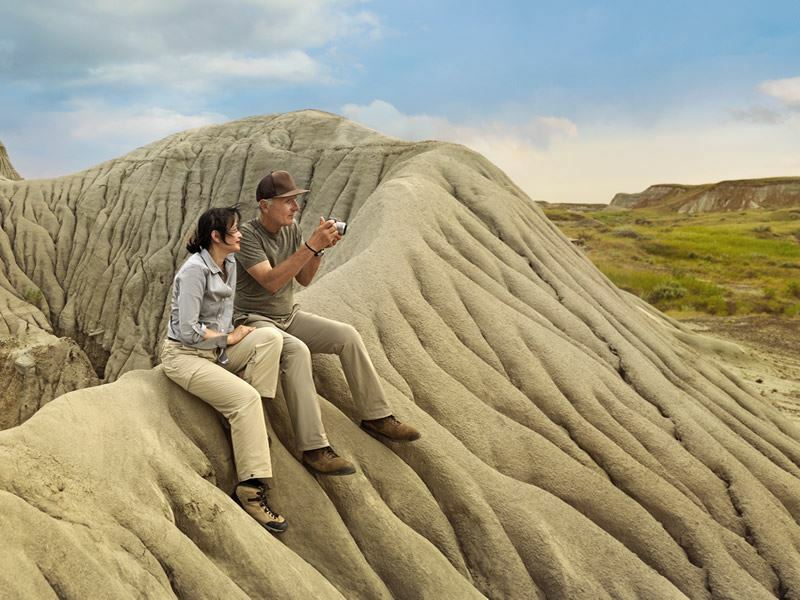 There’s no better way to experience the striking scenery and prehistoric wonders of the Canadian Badlands than with a journey along the Fossil Trail - a diagonal path through the province that covers all the major dino attractions. To the north, you have the Pipestone Creek bonebeds, whilst some 2,500 km to the south the trail ends at Devil’s Coulee. In-between, there’s the World Heritage Dinosaur Provincial Park to explore, a landscape of rugged beauty where some of the world’s most important fossil discoveries have been made. Participate in an authentic dig and take time out to enjoy the outdoors, hiking, biking, fishing or camping out beneath the stars. Then drop by the acclaimed Royal Tyrrell and Philip J. Currie Dinosaur museums to see some of the greatest finds for yourself and uncover the secrets behind the area’s unique ecosystem, geology and fossil history. Whether you’re planning a day excursion or an epic week-long road trip, the town of Drumheller - dubbed the Dinosaur Capital of the World - is the perfect place to base yourself for exploring all the major sights. Dinosaur remains are scattered right across the Badlands of Alberta, but by far the largest concentration are found in Dinosaur Provincial Park, situated in the valley of the Red Deer River, a short drive from the town of Brooks. Designated a UNESCO World Heritage Site in 1979, this spectacular park combines breath-taking scenery with some of the richest fossil fields in the world, virtually unmatched in terms of the quality and quantity of prehistoric remains. Since the first fossil discovery in 1880, more than 4,500 dinosaur skeletons, representing 44 species, have been uncovered in the park, with some dating back as far as 75 million years. The site is still very much active today, attracting palaeontologists from across Canada and the globe who are continually unearthing new discoveries. Get a taste for yourself on a guided tour, authentic dig or interpretive hike. 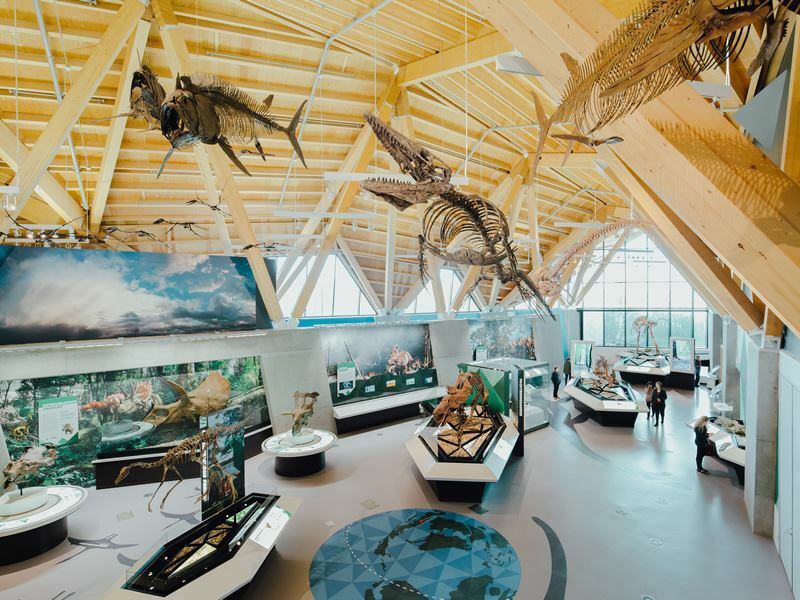 Also be sure to stop by the park’s visitor centre which features fascinating exhibits on the area’s ancient dinosaurs, natural history, geography and present-day ecosystem, as well as a video theatre, fossil prep lab and a range of public programs held throughout the summer. Most of the park is not openly accessible to the public, and you’ll need to book a tour with a park interpreter to see the most impressive bone beds. Over several hours, your guide will lead you on a hike right into the heart of the preserve, stopping en-route to scour for fossils amongst the dirt and rocks. Amazingly, you won’t have to look very hard before you stumble on something of interest. 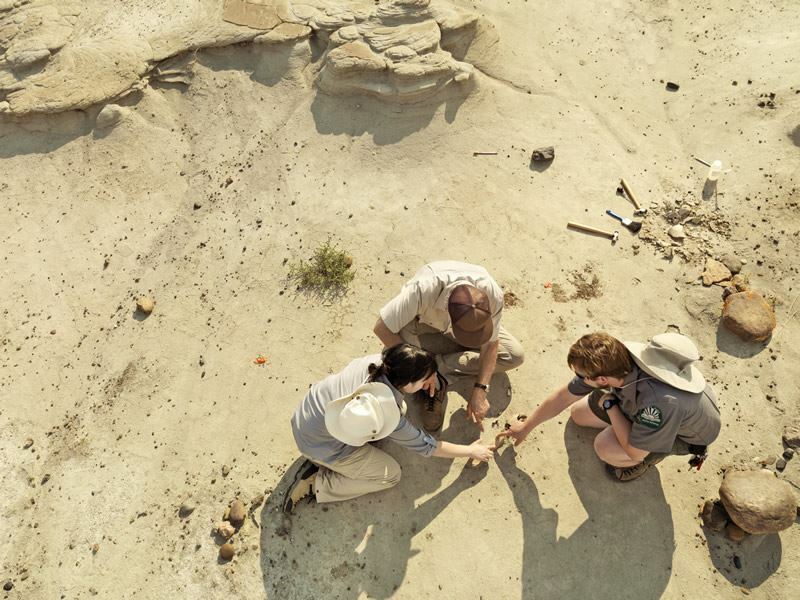 The ground is littered with millions of fossils and your knowledgeable guide will help you with where to look, what to look for and help interpret your findings. Each year, rain and run-off from prairie creeks wash away the top layer of soil, continuously exposing new fossils. You’re likely to encounter an array of teeth, bones, shells and even coprolite (fossilised dino dung!) You’ll also get the chance to learn more about other fossil types, including everything from microscopic fern spores, to fish and amphibian skeletons and rare isolated fragments from ancient mammals. The provincial park is home to five rewarding interpretive trails. The Badlands Trail, which runs adjacent to the park’s private preserve area, climbs up sandstone ridges cut with tiny streams and winds around towering pinnacles bathed in bronze and amber shades. Interpretative signage sheds light on the evolution of this unique habitat and explains why so many fossils have been preserved here. Explore the area’s lush riverside ecosystem and enjoy fantastic birdwatching along the Cottonwood Flats Trail, or take the Coulee Viewpoint Trail up to a high ridge to take in the stark beauty of the arid landscape from a bird’s eye perspective. Certain sections of the park are also available for “random access” - where you’re free to climb the hills and hoodoos - as well as a public scenic loop road where you can drive, walk or cycle 3.5km through the Badlands. Additional recreational activities include paddling down the tranquil Red Deer River, as well as biking, geocaching and birding. All in all, this park isn’t only about the prehistory. A range of exhilarating outdoor pursuits, along with stunning scenery, big blue skies and unusual wildlife complete the experience. There’s no better way to immerse yourself in this otherworldly landscape than by camping outdoors. Set up home beside the river or under massive cottonwoods and spend long evenings admiring the stunning sunset and vast dark starry sky. 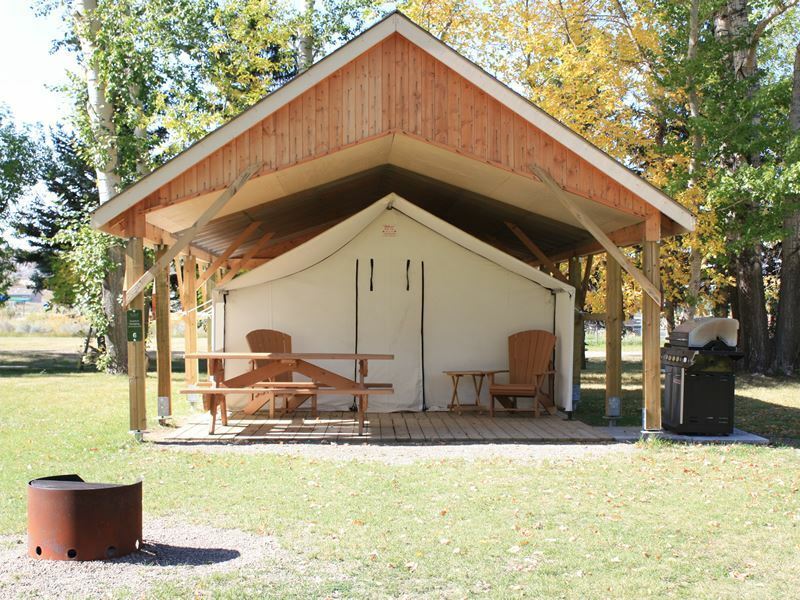 The park features 12 designated campsites available for RV, tent or comfort camping. If you don’t fancy skimping on creature comforts, several wooden shelters housing large canvas tents are available. These are decked out with wooden floors, a double bed, soft linens, electricity and kitchen supplies, along with a private deck and outdoor grill for enjoying a homecooked BBQ overlooking the river. Of course, plenty of back-to-basic options are also available, with nearly 200 pitches spread throughout the park and a full range of facilities available, including picnic sites, a grocery store, café and food stalls, along with interpretive viewpoints, an amphitheatre, outdoor fossil displays and kid’s playground. Located just outside Drumheller, Canada’s highly acclaimed Royal Tyrrell Museum houses one of the world’s largest displays of dinosaur skeletons, as well as with being a world-leading research and educational facility on the science of palaeontology. Scientists travel from across the globe to study the museum’s vast collections, but there’s plenty on offer for the public too, with a wealth of fun exhibits, activities and programs suitable for all ages. The Royal Tyrrell boasts nine ever-changing exhibits displaying some of the museum’s most remarkable finds. Best of the bunch, is the mesmerising Dinosaur Hall which includes more than thirty complete skeletons and fleshed-out replicas of species such as the huge Camarasaurus and mighty Tyrannosaurus rex. Learn about other prehistoric periods and see a range of plant and animal fossils in the lush Cretaceous Garden, Mammal Hall and Ice Age exhibits, and don’t forget to pass by the preparation lab to watch technicians hard at work exposing new fossil finds from the rocks. Other activities include fossil casting, video screenings in the auditorium, and even the chance to learn directly from top scientists in the museum’s Passion for the Past programme. Venture outside the museum to take part in an exhilarating hike and fossil hunt in the Badlands of the Midland Provincial Park. Throughout the tour, an expert guide will bring the prehistoric past to life through stories and explanations about Alberta’s dinosaurs and rich fossil heritage. Touch authentic fossils and see real dinosaur remains still embedded in the ground. To gain further insight into the thrill of fossil excavation, take part in a simulated dig in a realistic quarry. Hunt for fossil replicas and learn more about the tools and techniques of palaeontology as you dig. If you’re not sure where to start among all this, the museum have put together several ready-made itineraries to help visitors plan their day and get the most out of a visit. 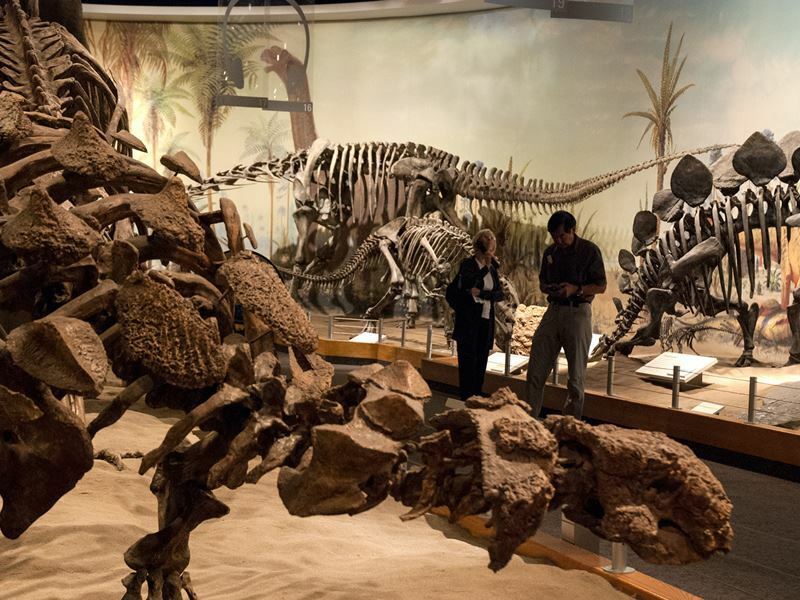 Recently opened in 2015 by Canada’s leading palaeontologist, this internationally-renowned museum offers yet more dino-related attractions, from public galleries to field experiences, theatre showings to palaeo-labs, and plenty more. The museum’s modern exhibits take you on a chronological journey through prehistoric time, right up to the oil exploration days of present-day Alberta. Marvel at the huge collection of fossils, casts, murals, reconstructions and intriguing artefacts, most dating from the Wapiti Formation some 80-69 million years ago. In the main gallery, there’s also the chance to admire several newly identified dinosaur species that have been displayed nowhere else in the world. Associated exhibits on flora, fauna, geology and climate, do an excellent job in reconstructing the prehistoric world, bringing the age of the dinosaurs to life in vivid detail. Next up, delve into the increasingly high-tech world of fossil finding and excavation at the museum’s hands-on lab, then have a go at making your very own fossil replica. 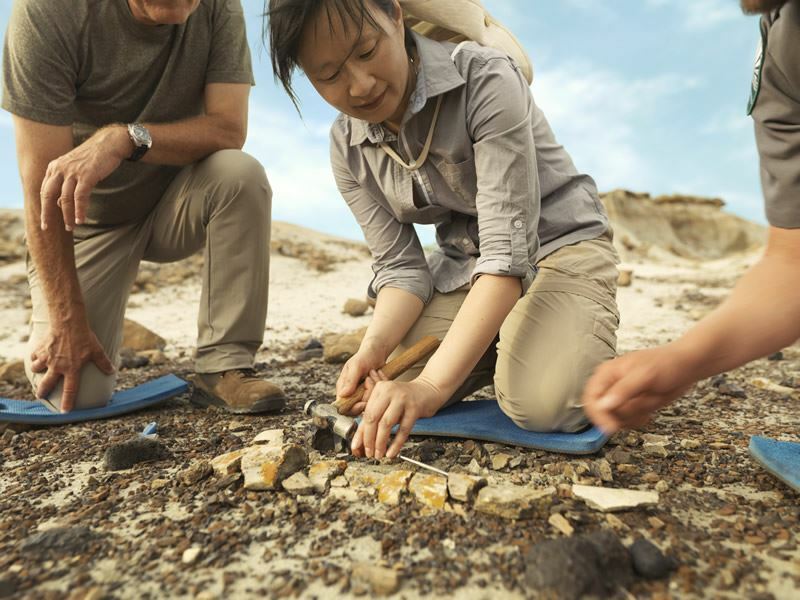 During the summer, there’s also the chance to get out and about on a full-day field experience, touring some of the densest dinosaur bonebeds in the world. In the museum grounds, be sure to explore the outdoor fossil discovery walk, let the kids loose in the playground and take time to admire the highly acclaimed innovative design of the museum building itself. Then stop by the family-friendly Dine-O-Saur restaurant to refuel and relax on the spectacular patio, before dropping by the gift shop to pick up a unique memento of your visit.